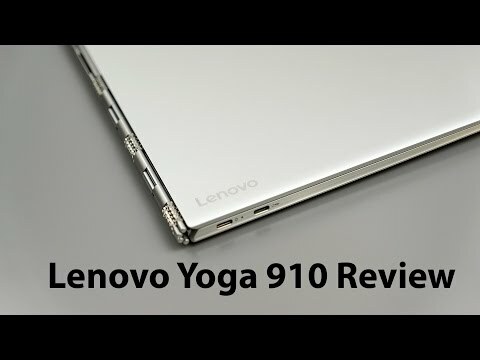 Lenovo Yoga 910 is a convertible 2 in 1 device with a 360 degree hinge. It can be used as a laptop as well as tablet. The screen measures 13.9-inches. It boasts of a 4K display with resolution of 3840 x 2160 pixels. There is a touchscreen function enabled on this device. A 0.9MP webcam facilitates video calling functions. For audiophiles, this laptop is equipped with the best configuration. There are 2 x JBL stereo speakers with Dolby Audio Premium for enhanced sound experience. For plugging any audio device, a headphone + microphone jack is provided. Under the hood, the Yoga 910 houses an Intel Core i7 (7th gen) processor clocking a speed of 2.7GHz. The processor is paired with 16GB DDR4 memory at a frequency of 1600MHz. In terms of storage, this laptop offers 1TB storage capacity in form of Solid State Drive & uses PCIe interface. On the hardware front, the laptop has an Intel HD Graphics 620 processor onboard. Performance-wise, this laptop functions smoothly without any lags. The device ships with latest version of Windows 10 operating system out of the box. On the battery front, the Yoga 910 is powered by a 4 Cell Li-Polymer non removable battery with a capacity of 78 Whr. It can last up to 9 hours on a full charge. This laptop doesn’t have too many ports & slots. It has just one USB 3.0 port for connecting any peripherals and one USB Type-C port for fast data transfer & charging. Connectivity options on the device include Bluetooth v4.1 for transferring files wirelessly & WiFi for connecting to the internet. On the weighing scale, this laptop weighs just 1.38 kg. In case of any malfunction, there is a 1 year warranty from the date of purchase.